When selecting a flooring system for your facility, there are three factors to consider: the type of facility, the budget and the current condition of the substrate. The first questions to ask yourself is: What are we doing in our facility? Asking yourself what the building’s use is will determine what type of floor system best suits your facility. For example, a food processing facility will require a different flooring system than that of an automotive manufacturer. Food industry flooring requirements are usually driven by government standards against bacteria and whatnot. On the other hand, the type of flooring in the automotive industry is driven by durability, impact resistance, safety and sometimes aesthetics. The next questions to ask yourself is how much of an investment are you willing to make into your facility? There are several types of flooring systems to consider based upon your budget, but you may only need certain features. Going back to the example used above, the flooring system for facilities in the food and beverage industry will be driven by government cleaning standards and function. Whereas in the automotive industry, in many instances, the budget is based upon the longevity, safety requirements and environmental standards the facility needs to meet. For instance, an automotive factory needing to meet safety requirements may require line striping for crosswalks and forklift lanes. This seems like a lot to take in, but don’t fret! The experts at Hoover Wells can help tailor your specific flooring system to fit within your budget. The next factor to consider is the current condition of your substrate. Is your concrete new, old, oil saturated, exposed aggregate or is there a existing coating? With new concrete you have a blank canvas to work with, but old concrete will almost certainly need more attention. Older concrete that is pitted and porous may require additional patching or extra coats of primer. This will add costs to your flooring system. If your facility has exposed aggregate or oil saturated concrete, you are probably going to need to resurface the concrete using an epoxy mortar or a similar product. 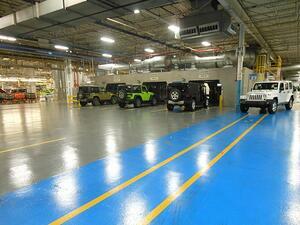 Lastly, if there is an existing epoxy coating you must consider multiple variables. Do you prefer a polished concrete finish? If so, the existing flooring material will need to be removed in its entirety. Do you prefer epoxy flooring as your finish? If epoxy is your preference, it must be determined whether the existing epoxy coating is adhered to the concrete or if it is delaminating and must be removed. Download our presentation on finding out which floor system your company needs.